Learn about the benefits and negatives of using various source types for your research. Use the menu on the left, or the buttons at the bottom of the guide to navigate through this tutorial. In each page, you will learn about when it would be appropriate for you to use each type of source for your research, the positives and negatives for each source, and where you can find such sources. Articles can come from different types of sources. What kind of source you use will determine what kind of writing you are looking at. The types of sources typically associated with articles are: Scholarly or peer-reviewed journals, trade or professional publications, and magazines. How do you know which type of source you are looking at? Sometimes you can tell just by looking at it. Think of the popular magazines you see. They tend to have bright colors, bold headlines, and lots of photographs. Scholarly journals on the other hand tend to not to be very eye catching, they will probably have charts, graphs, and tables but not many pictures. Popular magazines will also have a lot of advertisements while scholarly journals will have very few. Trade journals will fall in between. They may have a few ads (usually in relation to the profession) but not as much color or images as a magazine. To really determine what kind of source you have you need to look at the content. As you read an article think about who is writing the article and putting it out. Magazines tend to be written by staff or freelance writers with no expertise in the subject of the article. They are usually published by a for-profit company. Trade journalist sometimes have expertise in the area and are usually put out by professional organizations, although they may partner with either a commercial publisher or an scholarly press. Scholarly journals are written by experts in the field and published by either a professional organization or a university press. Peer-reviewed articles are evaluated by other experts in the field before they are published. A scholarly article is not always 'peer-reviewed' to find out if it is you need to look at the article submission guidelines of the journal. Who are these articles for? A popular magazine is written for anybody. You don't need to know anything about the subject of the article, you don't need to know any special vocabulary. Professional journals are to be read by people in the field so the jargon, or vocabulary of that field is often used. Scholarly journals are also written for people knowledgeable about that subject area, people who are familiar with specialized vocabulary and concepts. Why has the article been written? With a popular magazine articles are usually to entertain the audience or to sell something; that something could be the magazine itself. Trade or Professional journal articles provide information on what is going on in that subject area to people in that field. For instance the articles could be about research that is going on or how research findings are being used, or news and happenings (such as upcoming conferences and other professional development opportunities). 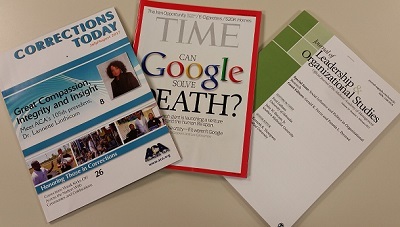 Scholarly journals often report on research or research techniques, usually the person or persons who are writing the article are the people conducting the research. The last thing to consider is if there are references included at the end of the article. Scholarly journals will always have citations (in-text or footnotes/endnotes, and a list of other articles referred to). Professional journals will sometimes have bibliographies or references, but not always, and rarely as long as the reference lists you'll see in a scholarly journal. Magazines will rarely include references.